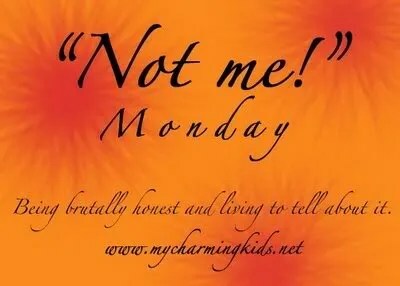 Well, I’m too late to be included in her blog links, but I like the idea of Not Me Monday started over here. Better late than never. But eh, try wait! It’s still Monday here! 1: It was NOT ME who didn’t finish folding the laundry. 2: It was NOT ME who didn’t make the bed this morning. Definitely not me. 3. It was NOT ME who got upset at slow traffic during rush hour. 4. It was NOT ME who didn’t finish her whole workout at the gym today. 5. It was NOT ME who didn’t scrub out the bathroom sink this morning. 7: It was definitely NOT ME who didn’t wash her car yesterday. I love reading this meme! You guys are too honest! Too many confessions! I’m impressed that you even went to the gym. Forget finishing the workout! I did do all those things you listed… because I’ve got it together and I’m organized. NOT!! hahahaah! I’m glad you participated, how fun!